The Beautyrest Studio 7.5&quot; Low Profile Adjustable Steel Bed Frame, Easy No Tools Assembly, Multiple Sizes is a heavy-duty bed frame strong enough to support all bedding. Made of heavy duty high carbon steel, with a water-based, lead-free finish. This 9-leg bed frame will support 2000 lbs. It does not require nuts, bolts or tools to assemble. The Beautyrest Studio 7.5" Low Profile Adjustable Steel Bed Frame, Easy No Tools Assembly, Multiple Sizes is a heavy-duty bed frame strong enough to support all bedding. Made of heavy duty high carbon steel, with a water-based, lead-free finish. This 9-leg bed frame will support 2000 lbs. It does not require nuts, bolts or tools to assemble. I bought a Simmons Beautyrest Silver which required a more substantial frame to support the mattress/foundation. This fit the bill with a center support and 9 feet. Easy to assemble, no tools required. The feet require a bit of heavy pressure to get seated all the way, it is easier to assemble the frame with feet and then set it on the floor and apply pressure on top of frame to get this done. Before I purchased I read the reviews first. And the product met my expectations. For those using this with a twin bed, you don't need the middle bar. I didn't read the instructions carefully :) But save the part for a future purchase of a queen or king-sized bed. It works great because we just purchased a twin mattress with a box. The best thing I like about it is I can now put an underbed storage bin underneath. Best buy for the buck! Great quality and what I was looking for in a frame. The fact that this was able to be re-sized if I ever buy a bigger mattress is a plus. Easy setup, box was not big. Beautyrest brand lots to like bout this product. I am a 6' 4" 315 pound man and this was a big improvement from my worn out frame. My wife and I had purchased a mattress that had begun sinking to the middle after about two years. 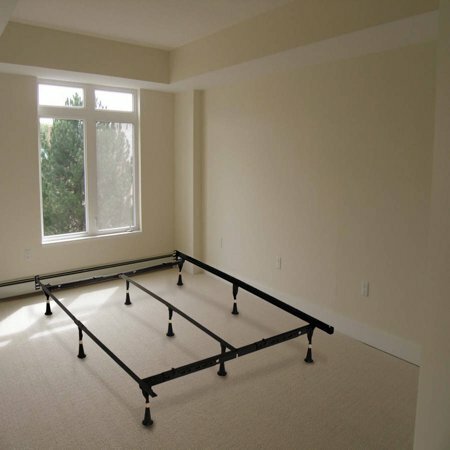 The Beautyrest bed frame actually improved the mattresss. We ordered from Wal-Mart. It came as advertised. It took about 30 minutes to adjust for queen frame. I would definitely buy this product again. We were looking for an inexpensive but quality bed frame and chose this one after reading positive reviews. We can't argue with the price and short time it took to arrive (we got free shipping too). This was so much easier than choosing one in the store and lugging it home. Easy to assemble and the gauge of steel and solid construction was pleasing to find considering it was so economical. My only concern was that at the widest setting ..The Eastern King" it seemed to allow about 2 inches too much for the foundation.. and in fairness this may be because various mattress manufacturers vary in finished width and having it too short would be a worse problem.. The skirt on the bottom covers the space.. all is well in the bedroom! I bought this frame to support a king size mattress for my wife and I. I weigh about 225 pounds and my wife is 100 pounds soaking wet. I bolted this frame to a wooden headboard. We sleep on it every night now and it shows no sings of giving up the ghost. So it does what it is supposed to! Setup was super easy and I did it myself in just a few minutes. The end to bolt to the headboard lined up and there were no problems. The feet fit without struggle or modification. It squeaks a little bit when we move in the bed but it isn't super loud or annoying but it is audible. It is fairly sturdy but it is not so rock solid that it inspires you to jump up and down on the mattress and do front flips. I ranked it 3 stars because it does the job and I expect there are options that would be much sturdier and probably others that are less sturdy. So if you just need something to do the job without any pretenses of being considered estate worthy or heirloom quality, this will be just fine. I was excited about my new bed frame, when I opened up the box and began to set it up, one of the bars on the side was bend out of shape . I literally had to get pliers to bend it back in order for it to Hold up properly. Most likely will be returning it.